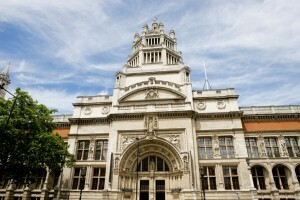 Without a doubt, the Victoria and Albert Museum is one of the most fascinating London art museums. It serves as the home for nearly five thousand years’ worth of art, from sculptures to paintings, to genuine artifacts. Since its establishment nearly 165 years ago, many grand and exciting pieces of art have been on display. Let’s start with a little history about how this remarkable museum began! You may be familiar with the Great Exhibition, the very first exhibition of manufactured products in London. Just one year later, in 1852, the museum was established following inspiration from this successful event. It was originally known as the Museum of Manufactures and was meant to inspire designers and manufacturers, as well as the British working class. It became the Victoria and Albert museum after Queen Victoria had new foundation set for the museum’s new building in 1899, near the end of the Victorian era. Named after Queen Victoria’s contributions and Prince Albert’s passionate support (he did help organize the Great Exhibition, after all), it began to grow into the educational and motivational display it is today. The museum displays arts of various mediums, including textiles, jewelry and photographs. Among its collections and display you will find artwork by the famous English Romantic painter John Constable, Raphael tapestry designs for the Sistine Chapel, a room dedicated period wardrobe, and Henry VIII’s authentic writing box, displaying his coat of arms. These are only some of the many magnificent artifacts and art displays to be seen at the museum. A large museum with expansive collections, there truly is something for everyone to admire. Make sure to include this historical museum in your London trip plans. Or, travel with AESU and we’ll get you there! Explore famous London art museums in person! AESU offers several trips to England, including: Cosmopolitan, Euro Spree, Explorer, Euro Focus, and our most popular tour, Great Escape. Explore England and its rich history and culture, plus explore London art museums and other fantastic sights! This entry was posted on Thursday, May 19th, 2016	at 11:47 am	. You can follow any responses to this entry through the RSS 2.0	feed. Both comments and pings are currently closed.